Thread: Petition: Are you willing to demand that President Trump Veto Amnesty? 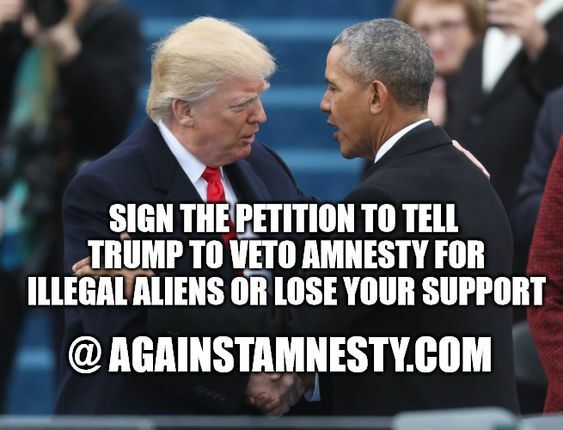 We have a new petition up on our site www.AgainstAmnesty.com, and we need Americans who are willing to tell the Democrats, RINO Republicans, and President Trump they will not longer support them if they vote for, pass, sign, or fail to veto any form of Amnesty for illegals. Right now we need to test 1. The website and all features. (Feedback on site to Alerts@alipac.us) and 2. How many Americans like you are willing to sign and then share our petition to make it clear to President Trump and others that we will never vote for them again if they pass Amnesty for illegals. Last edited by ALIPAC; 03-18-2019 at 10:28 AM. That is what makes our country so great or we would be an out of control, corrupt, lawlessness Nation like much of the rest of the world. That is what the Democrats and Rino's are turning this great country into...a complete lawless Nation putting criminals above law abiding citizens. They are reversing all the hard work that those have fought for, and sacrificed their lives for, to make this country great, peaceful and prosperous. Our elected officials ARE bought and paid for by rich lobbyists, Soros, NWO, and the lawlessness Nations of the world. We need to end the "pay offs" and lining the pockets of these traitors to our country who are serving in the office FOR the people. We need Term Limits and we need to end the buy offs! Our Laws have NO color. Our Laws apply to all, including those who are legally in this country, and those who are not! It is a Felony to vote in this country if you are not a legal U.S. citizen. Another law the Democrats are blatantly disregarding and that is Sedition...they need to be charged for registering illegal aliens to vote in attempt to overthrow our government and the American people. We oppose any form of Amnesty or Path to Stay for Criminal Trespassing Illegal Aliens and those who are pouring over our border by the thousands. Deport them on the spot. No more two sets of rules for illegal aliens and those who come legally the right way. We want Public Charge laws enforced...remove them from the country and get them off our taxpayer funded benefits. We want Visa Overstay laws enforced...no matter what color they are or county they came from. Remove them now! We want Student Visa laws enforced...remove them from our country. And NO illegal aliens should attend our schools, they have no student visa and that is giving these foreigner citizens, who are not here legally, a FREE pass to break our laws and be awarded our taxpayer funded benefits! They do not qualify to attend our schools and need to be disenrolled now! It is the duty of this government to protect our border from this invasion. To stop rewarding criminal trespassers who have NO right to be on our soil and for those Judges who swore to the oath of office to stop letting them go and hand them over to ICE. End the Refugee, Asylum, TPS, and illegal alien programs...we are being RIPPED off, taken advantage of and we owe these people nothing. Stop stealing our tax dollars to pay for this! No DACA...take your DAPA parents and go home. No birthright citizenship...they are not U.S. citizens. Democrats started issuing them Birth Certificates in the 60's. More Democrat FRAUD, changing our laws to suit their political corruption. No path to stay...they have not earned it. They jumped in line of those following our laws to come here legally. No amnesty #8, #9, or #10. CLOSE THAT BORDER DOWN NOW AND LOAD THEM ON BARGES AND BUSES BACK HOME! STOP EMBEZZLING OUR TAXPAYER MONEY, DIVERTING THOSE FUNDS, TO HARBOR, AID AND ABET ILLEGAL ALIENS! ALIPAC, stoptheinvaders, hattiecat and 4 others like this. Beezer, ALIPAC, stoptheinvaders and 1 others like this. Signed, and just wanted to add this.....it appears the WH is not listening to anyone. This is a month old, but I believe it needs to be posted. In an interview with FNC's Dana Perino, White House Press Secretary Sarah Sanders dismissed the idea that Ann Coulter had any influence in the White House. Coulter, the author of "In Trump We Trust: E Pluribus Awesome," strongly denounced the president's decision to sign a compromise border security bill and declare a national emergency on Twitter and in a radio interview on Friday. "I don’t think Ann Coulter has any influence over this White House, or influence over much of anything, to be honest. I don’t think she did before the president became the president. I don’t think she does now. I just don’t see her as being an influential voice in this country, and certainly not one in this building," Sanders said.